The Minimum Temperature was 3 to 4 C above normal during 5th to 7th February. Rajkot recorded 18.5 C on 6th February about 4 C above normal. Subsequently the Minimum dropped again to near normal on 8th and 9th February. Today Rajkot Minimum was 14.5 C which is normal. 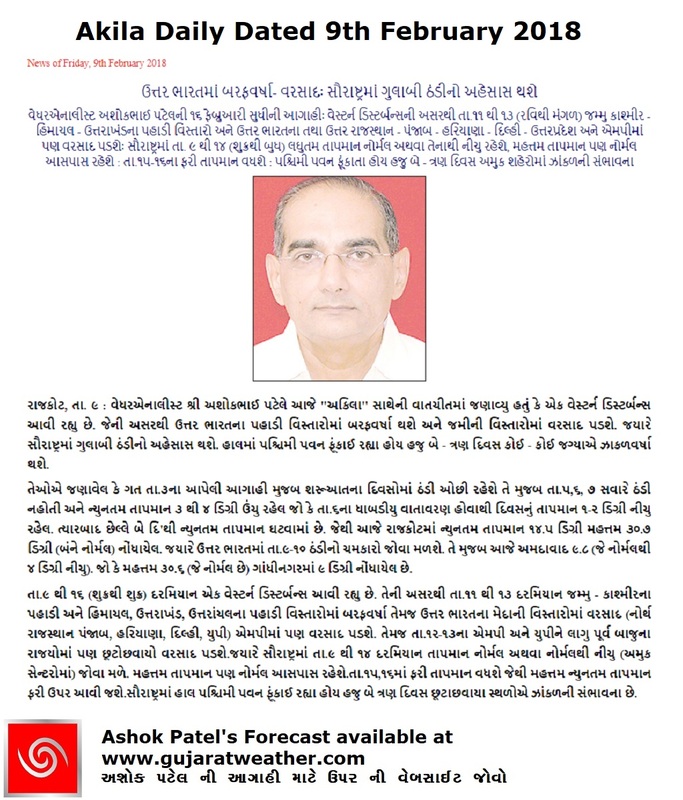 However, North Gujarat has recorded a sharp drop in Minimum Temperature as had been forecast. Ahmedabad Minimum was 9.8 C which is 4 C below normal and Gandhinagar at 9.0 C today the 9th February. Due to a fresh Western Disturbance affecting North India and adjoining areas from tomorrow on wards, during 11th to 13th there will be Snowfall over the hilly regions of Jammu & Kashmir, Himachal Pradesh, Uttarakhand along with scattered rain showers over the plains of North India over parts of North Rajasthan, Panjab, Haryana, Delsi, Uttar Pradesh, Madhya Pradesh and most of the adjoining States of M.P./U.P. 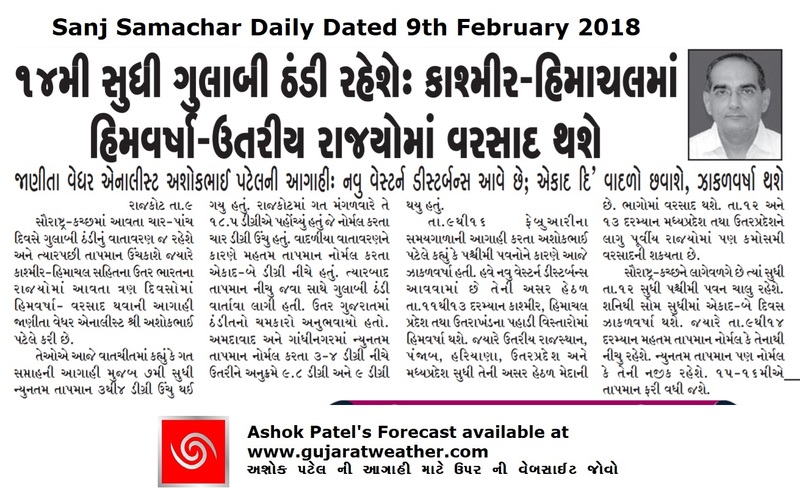 The Temperature will be near normal and pleasant during 9th to 14th February and subsequently the Temperature will be above normal on 15th/16th February over most parts of Saurashtra, Gujarat & Kutch. 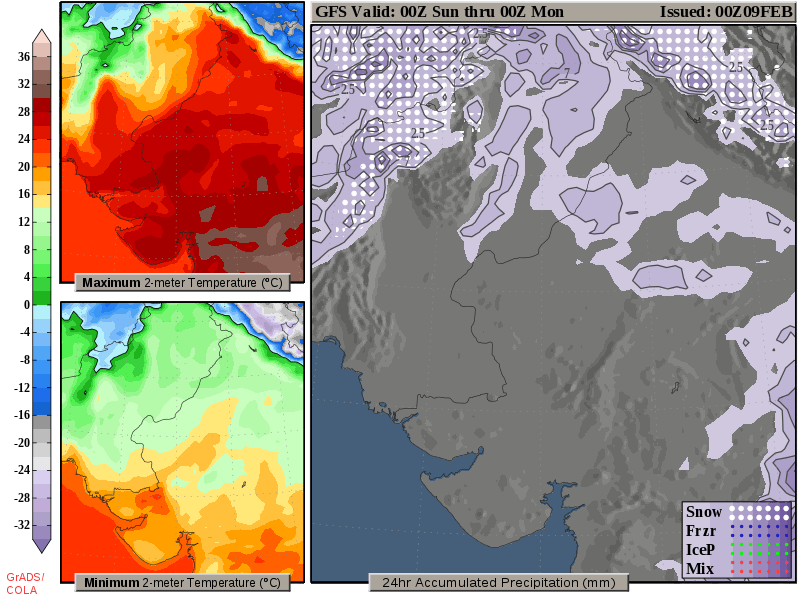 Due to Northwest and Westerly wind over Kutch & Saurashtra till 12th there are chances of foggy conditions on two of the days over few parts of those regions. Cloudy on a day or two. The Temperature is expected to become warmer and will be above normal on 15th & 16 February for most of Saurashtra, Gujarat & Kutch. સૌરાષ્ટ્ર, ગુજરાત અને કચ્છ માં ન્યુનતમ તાપમાન ગુલાબી ઠંડી જેવું અને નોર્મલ આસપાસ રહેશે તારીખ 9થી 14 ફેબ્રુઆરી દરમ્યાન. તારીખ 10 થી 12 દરમિયાન કચ્છ અને સૌરાષ્ટ્ર માં પવન ઉત્તર પશ્ચિમ તેમજ પશ્ચિમી રહેશે જેથી બેક દિવસ છુટા છાંયવાયા વિસ્તાર માં ઝાકર ની શક્યતા છે. એક બે દિવસ છુટા છવાયા વાદળો રહે. તાપમાન 15 અને 16 તારીખે ફરી સૌરાષ્ટ્ર, ગુજરાત અને કચ્છ માં તાપમાન ફરી નોર્મલ થી વધુ થશે. sir runing time nu dew point temp. 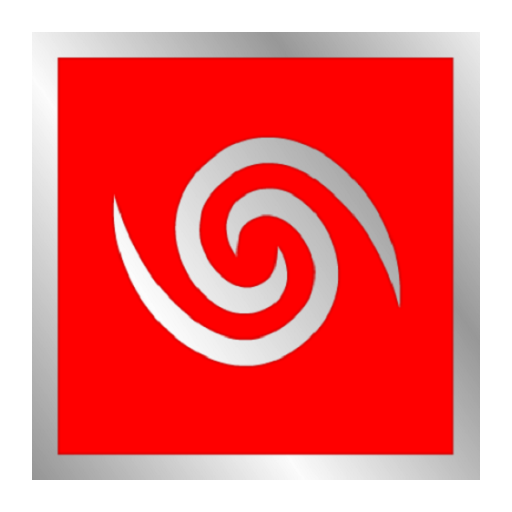 jota aavde se pan aavti kalnu dew point temp. kevi rite jovay? Windy ma Menu ma option chhe Right side ma (…) aava oobha tapaka chhe tene click karo etle khajano khulshe. Pachhi dew point select karo etle Alag alag divas aney time nu dew point jova malshe. Sir tarikh 22 thi zakal no round saru thay tevu lage che. Abhyas Barabar che? 7/8 divas pachhinu hoy fer fr thata hoy chhe.